It is estimated that over 7,000 TBtu/year (Trillion British Thermal Units) of energy is used for process heating by the manufacturing sector in the United States. This energy is in the form of fuels—mostly natural gas with some coal or other fuels—and steam generated using fuels such as natural gas, coal, by-product fuels, and some others. Combustion of these fuels results in the release of heat, which is used for process heating, and in the generation of combustion products that are discharged from the heating system. All major US industries use heating equipment such as furnaces, ovens, heaters, kilns, and dryers. The hot exhaust gases from this equipment, after providing the necessary process heat, are discharged into the atmosphere through stacks. 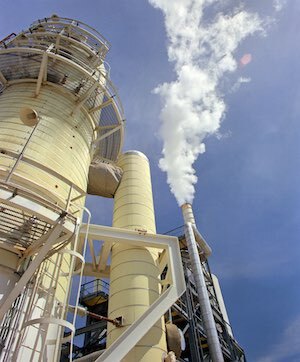 The temperature of the exhaust gases discharged into the atmosphere from heating equipment depends on the process temperature and whether a waste heat recovery (WHR) system is used to reduce the exhaust gas temperature. The temperature of discharged gases varies from as low as 200°F to as high as 3000°F. Combustion products themselves, generated from well-designed and well-operated burners using gaseous and light liquid fuels, are relatively clean and do not contain particles or condensable components that may require “cleanup” before discharge into the atmosphere. However, during the heating process, the combustion products may react or mix with the product being heated and may pick up constituents such as reactive gases, liquid vapors, volatiles from low-melting-temperature solid materials, particulates, condensable materials, and the like. Some or all of these constituents, particularly at high temperatures, may react with materials used in the construction of downstream heat WHR equipment and create significant problems. Chemical reaction of exhaust gases and their solid or vapor content with the materials used in the WHR equipment. Deposit of particulates in or on surfaces of WHR equipment. Condensation of organics such as tars and inorganic vapors such as zinc oxides and boron on heat exchanger surfaces. Erosion of heat exchanger components by the solids in the exhaust gases. Many of these problems are compounded by the high temperature of the exhaust gases, uneven flow patterns of the hot gases inside the heat exchanger, and operating variations such as frequent heating and cooling of the heat exchanger. Dealing with industrial heating processes in which the exhaust gases are at high temperatures, or that contain all reactive constituents, or can be considered as harsh or contaminated are important considerations for the process engineer. If unsure, professional advice from knowledgeable consultants should be sought to optimize the heating system. To discuss any process heating requirement you may have, contact Process Systems & Design at https://www.processsystemsdesign.com or by calling (410) 861-6437.